The United States is home to about 1.6 million Indian immigrants, making them the third-largest immigrant group in the United States after Mexican and Filipino immigrants. Between 2007 and 2008, the number of Indian immigrants surpassed the number of Chinese and Hong Kong-born immigrants for the first time since at least 1960. Indian immigration to the United States, a fairly recent phenomenon, grew rapidly during the 1990s and 2000s. In addition, people with Indian ancestry have also immigrated to the United States from the Caribbean, East Africa, Canada, and the United Kingdom. Indian immigrants are heavily concentrated in California and New Jersey (for more information on immigrants by state, please see the ACS/Census Data tool on the MPI Data Hub). Compared to other immigrant groups, the Indian foreign born are much better educated — nearly three-quarters of Indian-born adults have a bachelor's degree or higher. About one-quarter of Indian-born men in the labor force work in the information technology industry. This spotlight focuses on Indian immigrants residing in the United States, examining the population's size, geographic distribution, and socioeconomic characteristics using data from the U.S. Census Bureau's 2008 American Community Survey (ACS) and 2000 Decennial Census, and the Department of Homeland Security's Office of Immigration Statistics (OIS) for 2008 and 2009. There were about 1.6 million foreign born from India residing in the United States in 2008. Nearly half of all Indian immigrants resided in California, New Jersey, New York, and Texas. The Indian born accounted for about one in 10 immigrants in six states. Between 2000 and 2008, the size of the Indian immigrant population more than doubled in 10 states. Over one in six Indian immigrants resided in the New York metropolitan area. Indian immigrants made up at least 10 percent of the immigrant population in 10 metropolitan areas. 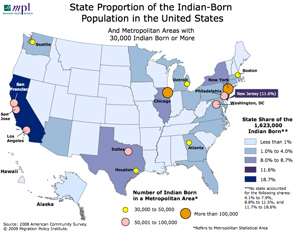 There were 2.3 million members of the Indian diaspora residing in the United States in 2008, including 455,000 native-born U.S. citizens of Indian ancestry. Over 40 percent of the Indian foreign born arrived in the United States in 2000 or later. Nearly three-quarters of Indian immigrants in 2008 were adults of working age. Indian immigrant men outnumbered women in 2008. Indian immigrants were as likely as the foreign born overall to be naturalized U.S. citizens. Three of every 10 Indian immigrants in 2008 were limited English proficient. About two-thirds of limited English proficient Indian immigrants spoke Hindi, Guajarati, or Panjabi. Nearly three-quarters of Indian foreign-born adults had a bachelor's degree or higher. Over one-quarter of employed Indian-born men worked in information technology. One-third of employed Indian-born women worked in management, business, and finance and in information technology. Indian immigrants were less likely to live in poverty than natives. Indian immigrants were as likely as other immigrants to own their own home. About one in eight Indian immigrants did not have health insurance in 2008. More than 550,000 children under age 18 resided in a household with an Indian immigrant parent. There were over than half a million Indian-born lawful permanent residents in 2008. Between 2000 and 2009, more than 635,000 Indian foreign born gained lawful permanent residence in the United States. Three out of five Indian immigrants receiving lawful permanent residence in 2009 were admitted as family-based immigrants. In 2009, the Indian foreign born made up 9 percent of all foreign academic-student admissions to the United States. About 400 Indian immigrants were granted asylum in 2009. As of 2008, 220,000 Indian-born lawful permanent residents were eligible to naturalize. In 2009, roughly 2 percent of all unauthorized immigrants in the United States were from India. The number of unauthorized immigrants from India rose 64 percent between 2000 and 2009. There were 1,622,522 foreign born from India residing in the United States in 2008, accounting for 4.3 percent of the country's 38.0 million immigrants. Relative to other groups, the Indian-born population in the United States grew rapidly during the 1990s and 2000s, increasing by 1.2 million — or about 65,000 per year — since 1990. Between 2007 and 2008, the Indian foreign-born population surpassed the Chinese and Hong Kong-born population to become the third largest immigrant group in the United States after immigrants from Mexico and the Philippines (see Table 1; see also the pie charts showing the top 10 countries of birth of immigrants residing in the United States over time here.). California had the largest number of Indian immigrants (303,497 or 18.7 percent of the Indian-born population) in 2008, followed by New Jersey (187,732, or 11.6 percent), New York (141,738, or 8.7 percent), Texas (131,729, or 8.1 percent), Illinois (129,187, or 8.0 percent), Pennsylvania (65,014, or 4.0 percent), Florida (59,169, or 3.6 percent), Georgia (54,111, or 3.3 percent), Virginia (53,674, or 3.3 percent), and Michigan (49,167, or 3.0 percent). In 2008, the Indian born made up 10.9 percent of all immigrants in New Jersey and 10.3 percent of all immigrants in West Virginia. They were also about one in 10 immigrants in Pennsylvania (9.8 percent), Delaware (9.7 percent), New Hampshire (9.5 percent), and Ohio (9.5 percent). The Indian immigrant population more than doubled in 10 states between 2000 and 2008. These states, which generally had small Indian immigrant populations in 2000, include Montana (from 253 to 1,009), Utah (from 2,030 to 5,629), Nevada (from 2,511 to 6,750), Idaho (from 845 to 2,269), Arizona (from 9,134 to 22,731), Washington (from 14,714 to 36,435), New Hampshire (from 2,530 to 6,244), Vermont (from 585 to 1,429), Mississippi (from 2,351 to 5,010), and the District of Columbia (from 1,139 to 2,350). On balance, the data suggest a growing Indian immigrant presence in the Mountain West. New York-Northern New Jersey-Long Island, NY-NJ-PA, was the metropolitan area with the largest number of Indian born (277,401, or 17.1 percent) in 2008, followed by Chicago-Naperville-Joliet, IL-IN-WI (116,395, or 7.2 percent); San Jose-Sunnyvale-Santa Clara, CA (78,001, or 4.8 percent); Washington-Arlington-Alexandria, DC-VA-MD-WV (67,340, or 4.2 percent); and Los Angeles-Long Beach-Santa Ana, CA (66,125 or 4.1 percent). In 2008, the Indian born accounted for 14.3 percent of all immigrants in the Trenton-Ewing, NJ, metropolitan area. They also accounted for more than 10 percent of immigrants in Syracuse, NY (13.8 percent); Pittsburgh, PA (12.3 percent); Cincinnati-Middletown, OH-KY-IN (11.9 percent); San Jose-Sunnyvale-Santa Clara, CA (11.8 percent); Columbus, OH (11.8 percent); Manchester-Nashua, NH (11.3 percent); Philadelphia-Camden-Wilmington, PA-NJ-DE-MD (10.9 percent); Buffalo-Niagara Falls, NY (10.7 percent); and Ann Arbor, MI (10.0 percent). There were 2.3 million members of the Indian diaspora residing in the United States in 2008. Of the 2.3 million members of the Indian diaspora residing in the United States in 2008, 66.4 percent were born in India, including individuals born in India to at least one parent who was a native-born U.S. citizen. One-fifth (20.0 percent) were U.S. citizens at birth. The remaining 13.6 percent were born elsewhere, mainly in Pakistan, Bangladesh, Fiji, the Caribbean (Guyana, Trinidad and Tobago, Jamaica), East Africa (Kenya, Tanzania, Uganda, South Africa), and the British Commonwealth (Canada, United Kingdom). The Indian diaspora in the United States is relatively small compared to the total population of India (1.1 billion in 2008 according to the World Bank). The number of Indian immigrants in the United States (1.6 million) is roughly the same size as the population of the Indian city of Agra, and the Indian diaspora (2.3 million) is about the same size as the population of the Indian city of Jaipur. Note: There is no universally recognized definition of the term diaspora. Most often, the term includes individuals who self-identify as having ancestral ties to a specific country of origin. To calculate the size of the Indian diaspora in the United States, we included all individuals who selected "Indian," "East Indian" or "Punjabi" (either alone or in combination with another option) in response to the two ACS questions on ancestry. As of 2008, 43.4 percent of the 1.6 million Indian foreign born entered the country in 2000 or later, with 29.9 percent entering between 1990 and 1999, 15.0 percent between 1980 and 1989, 9.0 percent between 1970 and 1979, and the remaining 2.7 percent prior to 1970. By contrast, 29.5 percent of the 38.0 million total foreign born entered the country in 2000 or later, with 28.7 percent entering between 1990 and 1999, 20.0 percent entering between 1980 and 1989, 11.4 percent between 1970 and 1979, and the remaining 10.4 percent prior to 1970. Of the Indian immigrants residing in the United States in 2008, 6.9 percent were minors (under age 18), 73.5 percent were adults of working age (between 18 and 54), and 19.5 percent were seniors (age 55 and older). Over half of Indian immigrants residing in the United States in 2008 were men (54.8 percent) and 45.2 percent were women. Among all immigrants, 50.2 percent were men and 49.8 percent were women. Among the Indian foreign born, 43.8 percent were naturalized U.S. citizens, compared to 43.0 percent among the overall foreign-born population. About 9.2 percent of Indian immigrants age 5 and older reported speaking "English only" while 62.4 percent reported speaking English "very well." Among the 455,000 limited English proficient Indian immigrants age 5 and older, 23.3 percent indicated that they spoke Hindi, 22.9 percent Gujarati, 17.6 percent Panjabi, 7.9 percent Telugu, 6.6 percent Malayalam, 5.2 percent Tamil, 3.2 percent Urdu, 1.9 percent Marathi, 1.2 percent Bengali, and 1.1 percent Kannada – all regional languages spoken in India. The remaining 8.7 percent spoke 29 other languages. In terms of academic achievement, Indian immigrants were better educated than other immigrants and the native born. In 2008, 73.6 percent of Indian-born adults age 25 and older had a bachelor's degree or higher compared to 27.1 percent among all 31.9 million foreign-born adults and 27.8 percent of all 168.1 million native-born adults. An additional 8.6 percent had some college education or an associate's degree compared to 16.4 percent among all immigrant adults and 30.8 percent of all native-born adults. On the other end of the education continuum, 8.9 percent of Indian-born adults had no high school diploma or the equivalent general education diploma (GED), much lower than both the 32.5 percent among all foreign-born adults and the 11.7 percent among native-born adults. About 8.9 percent of Indian immigrant adults had a high school diploma or GED compared to 21.9 percent among all foreign-born adults and 29.8 percent among native-born adults. In 2008, Indian-born men age 16 and older were more likely to participate in the civilian labor force (85.1 percent) than all foreign-born men (80.5 percent). Indian-born women (55.5 percent) age 16 and older were less likely to participate in the civilian labor force than other immigrant women (57.1 percent). Among the 713,000 Indian immigrant male workers age 16 and older employed in the civilian labor force in 2008, 27.0 percent reported working in information technology; 20.2 percent in management, business, and finance; 10.7 percent in other sciences and engineering; and 10.6 percent in sales (see Table 2). Among the 384,000 Indian-born female workers age 16 and older employed in the civilian labor force in 2008, 15.7 percent reported working in management, business, and finance, and 13.6 percent reported working in information technology (see Table 2). Indian-born women were also concentrated in administrative-support occupations (11.8 percent) and sales (10.6 percent). About 16.4 percent of Indian immigrants lived in poverty in 2008 compared to 37.9 percent of all immigrants and 28.7 percent of the native born. Note: Poverty is defined as individuals residing in families with total annual income of less than 200 percent of the federal poverty line. Whether an individual falls below the official "poverty line" depends not only on total family income but also on the size of the family, the number of children, and the age of the householder. ACS reports total income over the 12 months preceding the interview date. In 2008, about the same share (57.9 percent) of Indian immigrants age 18 and older owned the home they resided in compared to all immigrants age 18 and older (56.5 percent). The homeownership rate among Indian immigrants was still below the homeownership rate among native-born U.S.citizens (72.6 percent). Indian immigrants age 18 and older were more likely than other immigrants, and as likely as natives, to reside in a household with a mortgage or home loan. About 49.6 percent of Indian immigrants age 18 and older resided in households with a mortgage or home loan compared to 44.3 percent of all immigrants and 50.8 percent of natives. Just 13.4 percent of Indian immigrants did not have health insurance in 2008 — much lower than among all immigrants (32.9 percent) but higher than among the native born (12.9 percent). In 2008, about 558,000 children under age 18 resided in a household with a parent born in India. Most of these children (79.1 percent) were native-born U.S. citizens. Note: Includes only children who resided with at least one parent and households where either the household head or spouse was an immigrant from India. There were over half a million Indian-born lawful permanent residents in 2008. The 520,000 Indian-born lawful permanent residents (LPRs) in the United States in 2008 made up 4.1 percent of all LPRs (12.6 million). They are the third-largest LPR group after the foreign born from Mexico (26.9 percent or 3.4 million) and the Philippines (570,000 or 4.5 percent). Between 2000 and 2009, about 10.3 million immigrants obtained green cards, including 635,195 Indian born. The Indian born accounted for 5.1 percent (or 57,304) of the 1.1 million immigrants who received lawful permanent residence in 2009. The 2009 number was slightly lower than the numbers in 2008 (63,352) and 2007 (65,353). In 2009, 60.1 percent of Indian immigrants receiving lawful permanent residence were admitted as family-based immigrants — principally as the immediate relatives of U.S. citizens (21,532 or 37.6 percent) and as family-sponsored immigrants (12,911 or 22.5 percent). More than a third obtained LPR status as work-based immigrants or their family members (35.3 percent or 20,264) and 3.9 percent (2,228) as asylees or refugees. Out of 895,392 foreign academic-student (F-1 visa) admissions, 80,251 or 9.0 percent were from India. The 2009 number of Indian-born academic-student admissions was lower than in 2008 (85,067) but higher than in 2007 (74,276). Nearly half of foreign academic-student admissions in 2009 came from five countries: China (14.0 percent), South Korea (13.0 percent), India (9.0 percent), Mexico (8.2 percent), and Japan (5.6 percent). Note: Admissions refers to the number of entries, not individuals. Between 2000 and 2009, 7,696 Indian born were granted asylum in the United States, 414 of them in 2009. The annual number of Indians granted asylum in the United States peaked during the last decade at 1,552 in 2002. Virtually no Indian immigrants were accepted as refugees in 2009. U.S. Citizenship and Immigration Service's Office of Immigration Statistics (OIS) estimates the Indian born accounted for 2.7 percent of the 8.2 million LPRs eligible to naturalize in 2008. About 220,000 Indian-born LPRs, or 42.3 percent of all Indian born LPRs, were eligible to naturalize as of 2008. Roughly 66,000 did so that year. OIS has estimated that 200,000, or about 2 percent, of the approximately 10.8 million unauthorized migrants in January 2009 were born in India. The estimated number of unauthorized immigrants from India has increased from about 120,000 in 2000 to about 200,000 in 2009, an increase of 64 percent.